Well my brothers, what a fun time I had in Saint Cloud. During my three years as a principal officer of the Lodge, I always look forward to attending the Annual Communication. I see brothers from Lodges around the state and visiting dignitaries around the globe. We are truly a worldwide phenomenon, a Fraternity built upon the principles of Brotherly love, relief, and truth. The knowledge that I have gained from attending these Communications has made me a better leader to my Lodge. Firstly, I want to wish the Most Worshipful Grand Master, John Cook, a great year. He is a great Mason and has been an inspiration to me as a Masonic leader, passionate about getting our message to good men seeking to be made better men. He has been to Corinthian many times during my years in the Lodge and has always presented thought-provoking words to my brethren. I still have my Warden's Notebook, maintaining a calendar of events, and planning for the future of my Lodge. 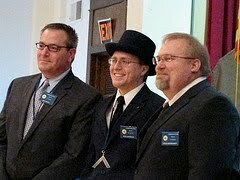 The whole cavalcade of brothers from Corinthian Lodge were in attendance including our Secretary. We were able to cover all the break-out sessions and meet as many brothers as we knew and many we didn't. Of course, the "forgetful" Master forgot his nametag again (you know, that little blue plate displayed on my chest in the photo to the left). Thank goodness that I've traveled so often that brothers remembered me. I'm thinking that I should just get my name stitched into my suits. It's great to see these brothers, able to talk shop about their Lodge activities. This year, my wife attended the open Annual Communication activities with me. The Banquet to the Grand Master was filled with fun, touching presentations, and a great Irish folk band. Although I won't speak for her, I think she had a great time, meeting these guys that I hang out with that she only knew by name. This was my last Annual Communication as a principal officer of Corinthian Lodge so the whole experience was bittersweet. Yet I know I will be at the next Annual Communication in Saint Cloud, happy to meet all of my brothers and friends again. And of course, my Lodge brothers and I will be traveling like we do each month, meeting new brothers and having new Lodge experiences and trying new things in my Lodge to reinvigorate my Lodge brothers.